Goat’s cheese goes particularly well with Swiss Deli Spanish Chorizo. You can roll out the pastry, make the filling and bake this tart in less than an hour. 1- First make the pastry. Sieve the flour onto your kitchen work surface. Cut the butter into pieces and place on top of the flour along with the cheese, salt and nutmeg. Rub the ingredients together with the tips of your fingers until all the lumps of butter and cheese have melted into the mix. This will take a few minutes. 2- Make a well in the center of the mix and fill it with the two yolks and the egg white. Work the egg in with your fingers, then gather the pastry into a ball and work it with the heel of your hand for 30 seconds. Use the pastry itself to mop up any loose bits of dough that adhere to your work surface. Work the pastry again for a minute, then shape into a ball, wrap in clingwrap and store in the fridge until you need it (you can make the pastry the day before you cook the tart). 3- When ready to make the tart, roll out the pastry to the approximate size of the pizza pan. 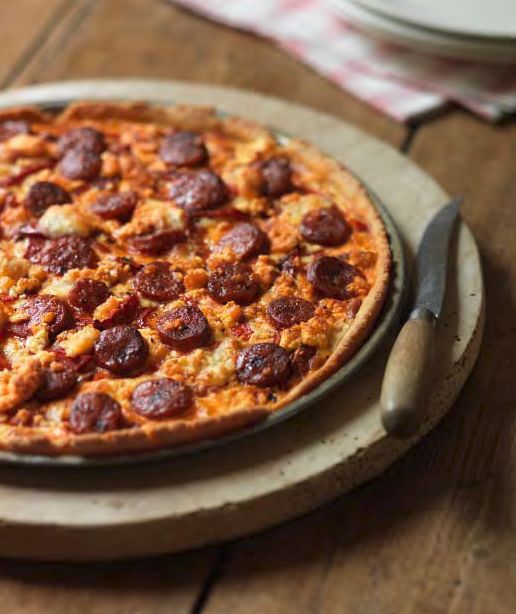 Use a shallow, non-stick pizza pan with a 1cm lip, approximately 1cm deep and 28cm across. Lay the pastry over it and press it down into the pan. Don’t worry about trimming it around the sides unless you feel the need strongly. 4- Preheat the oven to 240ºC. Bake the red pepper for 15 minutes until charred, then leave it to cool. Peel the skin away, remove the seeds and slice the pepper into thin strips. Reduce the oven temperature to 200ºC. 5-Mix the crème fraîche, egg, thyme and seasoning together with a fork or whisk. Spread the mixture onto the pastry, making sure it goes all the way to the sides. Sprinkle the goat’s cheese evenly on top, then lay over the roasted pepper strips in a haphazard manner, followed by the Swiss Deli Spanish Chorizo. Powder the surface with paprika and bake for 15–20 minutes until the chorizo is nice and browned. Eat while still warm.